IT WAS DIFFICULT to ascertain on the basis of media reports whether Brighton played host this month to a Labour Party conference or a Nuremberg rally. This article investigates claims of antisemitism at the Labour conference and finds them to be without factual basis. The 2017 Labour Party conference was a success for supporters of the Palestinian struggle for self-determination. Party leader Jeremy Corbyn snubbed a reception held by Labour Friends of Israel, a group which lobbies for close UK-Israel relations, and put enjoyably little effort into his excuse. According to the Telegraph, this ‘was the first time in over two decades that a Labour leader has not attended the annual event’. Delegates cheered as Corbyn’s keynote speech pledged ‘real support to end the oppression of the Palestinian people, the 50-year occupation and illegal settlement expansion and move to a genuine two-state solution of the Israel-Palestine conflict’. The call for ‘an end to the blockade, occupation and settlements’ [and the pledge that a Labour government ‘will immediately recognise the state of Palestine’—JSW] made in the 2017 election manifesto was outrageously omitted from the annual National Policy Forum report, which constitutes Labour Party policy once agreed by conference. On day one in Brighton, in the daily Conference Arrangements Committee report, the text mysteriously reappeared. While left delegates were delighted, no one knew quite how it had happened. In fact, the leadership, which was livid at the omission, had simply put its foot down. The bureaucracy may also have calculated that had it not conceded, the section would have been challenged, or ‘referenced back’, by delegates in any case. More generally, conference marked the consolidation of Corbyn’s leadership and the development of grassroots organisation within the party. Activists’ enthusiasm was palpable, while the intellectual ferment, organisational competence, creativity, sense of purpose, and wealth of new talent on display were thrilling to behold. Alex Nunns, author of a brilliant analysis of Jeremy Corbyn’s rise to power, concluded, ‘This was the first Labour conference to bear the imprint of the Corbyn era. It was a confident first step on the path to a democratic party. And it was the delegates themselves that forced the pace’. Ever since Corbyn was elected Labour leader, the right-wing press has sought to depict him and his newly-mobilised supporters as dangerous extremists. A key plank in this public relations campaign has been the accusation that Corbyn and/or his supporters have a problem with Jews. In April and May 2016, Conservative, pro-Israel and Labour rightist networks manufactured a ‘Labour antisemitism’ crisis ahead of the local elections to discredit the party and topple its leadership. Lack of evidence did not prevent these allegations gaining media traction. As 2017 conference season opened with Labour resurgent and the Conservative Party in disarray, it was only to be expected that the Tory press would revive the smear campaign, and so it proved. Andrew Percy, a former Conservative Minister, set the tone, branding Labour the ‘new nasty party’. Percy claimed, in comments reported by the Daily Mail, that, ‘What we are seeing is really dangerous’: Corbyn supporters have established a ‘cult of personality’ that is ‘deeply sinister, nasty and quite frightening. These people are genuinely extreme’. Signal sent, the right-wing press hammered home these attacks throughout the conference. Central to the campaign was the allegation that conference and its fringe events had played host to a ‘surge of hatred’ against Jews. Between 23 and 28 September, The Sun and the websites of the Times, Telegraph, Mail and Express ran between them more than 30 articles devoted to this theme. They were not subtle. ‘Don’t be a Jew in the Labour Party’, warned Tony Parsons in The Sun. ‘Labour seethes with an abundance of wild-eyed, mouth-foaming hatreds. The tumour of anti-Semitism that grows in the rancid guts of Labour moved centre stage at this week’s party conference’. Labour is ‘shot through with anti-semitism’, a Sun leader declared. ‘Corbyn’s supporters abandoned all pretence of belonging to the political mainstream’, the Daily Mail editorialised, ‘and exposed Labour for what it really is: Westminster’s nasty party’. ‘Holocaust denial, virulent anti-Semitism and Zionist conspiracy theories’, read Richard Littlejohn’s summary of the conference. ‘The Fascist Left have [sic] been in full flow’. ‘If ever there was an example of farce combined with despicable antisemitism’, Marcus Dysch fumed in the Jewish Chronicle, ‘this was it’. The ‘ugly . . . phenomenon of left-wing antisemitism’ was ‘amply on display on the Labour conference fringe’, claimed a Times editorial. For Stephen Pollard, Labour was ‘now the party of bigots and thugs, where Jew haters are cheered’. Senior Conservative Party officials got in on the action, with Environment Secretary Michael Gove announcing that ‘anti-Zionism is anti-Semitism’ and Secretary of State for International Development Priti Patel describing Labour as ‘the most antisemitic party . . . in generations’. The tenor of these attacks was so hysterical, the political agenda behind them so transparent, and the manipulation so blatant—to give one representative example, when Corbyn declined to attend the Labour Friends of Israel event, the Sun headline blared: ‘New Jew snub row’—that one might have hoped they would discredit themselves. But the depiction of Labour’s conference as a Nuremberg rally was given weight by less overtly partisan sources. The Board of Deputies of British Jews lamented the ‘ugly scenes’ and ‘disgraceful anti-Jewish incidents at the Conference’. The chairman of the Jewish Leadership Council claimed that ‘anti-semitism . . . continues to engulf the party’. The chief executive of the Holocaust Educational Trust was ‘shock[ed]’ to see ‘antisemitism rearing its head at a mainstream party conference’. Most astonishingly, the head of the Equality and Human Rights Commission declared that, ‘the Labour Party needs to do more to establish that it is not a racist party’. Allegations of antisemitism were also supported by certain quarters within the Labour Party. During the 2016 antisemitism witch-hunt, too, some Labour opponents of Corbyn had fuelled the smear campaign in order to discredit his leadership. But the internal politics heading into the 2017 conference were quite different. Labour’s strong showing in the June election had vindicated Corbyn’s position and united the bulk of the parliamentary party behind his leadership. Going into the conference, it seemed that this newfound unity might extend to the issue of antisemitism. The Jewish Labour Movement (JLM), a pro-Israel affiliate to the Labour Party, had participated in the 2016 antisemitism smear campaign at a time when Corbyn was isolated and his demise looked imminent. But after the 2017 election, it was the JLM that was isolated, and it hoped to use the party conference to return to the fold. The party leadership also desired reconciliation for the sake of putting the recurrent antisemitism controversy to rest. In 2016, the JLM had proposed a change to the Labour rule-book that would have provided for the expulsion of members found responsible for a ‘hate incident’, defined as ‘something’ that ‘the victim or anyone else think . . . was motivated by’ prejudice against protected characteristics. Opponents criticised this definition as overly broad, subjective and open to abuse. Ahead of the 2017 conference, the JLM negotiated with Labour peer Shami Chakrabarti to water down its proposal and reach agreement on a rule change to put to delegates. The agreed formulation was accepted by Labour’s National Executive Committee (NEC). With the JLM, the NEC, Corbyn, and Momentum all urging support for the resulting motion, it appeared that consensus had been achieved. In his speech to conference, JLM representative Mike Katz went out of his way to praise the ‘clear leadership’ and ‘amazing’ electoral performance of ‘our leader Jeremy Corbyn’ (approx. 1hr14m), and explicitly thanked Chakrabarti, the author of an inquiry into allegations of Labour antisemitism which prominent Jewish activists had dismissed as a whitewash. For his part, Jeremy Corbyn presented the JLM with the Del Singh Memorial Award for best practice. Alas, some troublemakers insisted on spoiling the party. Not everyone was willing to so quickly forget the JLM’s participation in the antisemitism smear campaign. Difficulties began when the family of Del Singh, a campaigner for Palestinian rights and aid worker who was killed by the Taliban, demanded that the JLM’s award be revoked on the grounds that the organisation ‘opposed much of what Del stood for’. Meanwhile, a number of Jewish members established an organisation—the Jewish Voice for Labour (JVL)—to challenge the JLM’s monopoly on representing Labour Jews. The JVL’s triumphant launch, apparently in the face of attempted sabotage, attracted a standing-room only crowd, and the organisation immediately gained the imprimatur of prominent figures (Palme d’Or and BAFTA-winning filmmaker Ken Loach, University of Oxford Professor Avi Shlaim, former Lord Justice of Appeal Sir Stephen Sedley) and the backing of major unions (Unite, ASLEF). When a Jewish delegate informed the conference of JVL’s launch and passionately repudiated the JLM’s right to speak on her behalf, she received a standing ovation and was embraced by Unite leader Len McCluskey as she left the stage (approx. 1hr8m). On the second day of conference, another Jewish delegate rubbed salt into the wound: ‘[Jewish Voice for Labour] launched last night with a massive meeting . . . [W]e are many, and I think maybe they [i.e., the JLM] are fewer than they say they are’ (approx. 2hr10m). Humiliated, and desiring to discredit the JVL before it gathered momentum, the JLM hit back with charges of antisemitism, which were gleefully seized upon by the right-wing press as part of its own campaign. The upshot is, it has fast become conventional wisdom that the Labour Party conference witnessed an eruption of Jew-hatred. For anyone sceptical of claims of endemic Labour antisemitism, the Guardian’s Jonathan Freedland had sharp words: ‘the evidence was there in Brighton if you were willing to see it’. Those alleging antisemitism at Labour’s conference all cite the same handful of incidents in support. Strikingly, virtually every allegation concerns statements made by… Jews. Mike Katz of the JLM, in his address to conference, delivered a mangled version of the old cliché: two Jews, three opinions. But if the Jewish Chronicle, The Times, International Development Minister Priti Patel, the Board of Deputies, the Holocaust Educational Trust, the Equality and Human Rights Commission, et al. are to be believed, a modification is in order: two Jews, three antisemites. If the claim that the Labour Party conference was terrorised by a thuggish vanguard of antisemitic Jews does not prima facie convince, investigation raises further doubts. In fact, not one of the specific allegations of antisemitism at the Labour Party conference withstands scrutiny. All either misrepresent events or impute antisemitism where none existed. The allegations fall into three categories: irrelevancies, fabrications and fantasies. Boycotting the state of Israel is not censorship—it’s putting it in its place. We do not invite Nazis and give then an hour to explain why they are right. This is the same thing. You did not invite South Africa to explain why apartheid was good for the blacks. In the same way you do not invite the Zionists. It was a very similar thing. Let us again assume that the quotation is accurate. In my view, Peled’s analogy was unhelpful: whereas ‘Nazis[m]’ and ‘apartheid’ clearly refer to extreme oppression, ‘Zionism’ can denote any one of a spectrum of beliefs ranging from the harmful to the benign (e.g., support for the right of Jews to collective self-determination). If politics is about uniting the many to defeat the few, it was also inept: a majority of British Jews identify as ‘Zionists’, even as they disagree over Israeli policies, while a majority of the British public not only supports the right of the State of Israel to exist but views ‘hating Israel and questioning its right to exist’ (quoting a YouGov poll) as antisemitic. Even so, there is nothing inherently anti-Jewish about analogising Israel to Nazi Germany, while Peled’s statement was evidently directed at supporters of Israel rather than Jews. This is about free speech. It’s about the freedom to criticise and to discuss every issue, whether it’s the Holocaust: yes or no, whether it’s Palestine, the liberation, I mean, the entire spectrum. There should be no limits on the discussion. [t]he Holocaust was a terrible crime that we must study and from which we must all learn. I reject the idea that Holocaust deniers, foolish as they may be, should be treated as criminals and I doubt that supporters of Israel should be given the authority to judge who is or is not a racist and antisemite. This happens to be the position of John Stuart Mill, who warned that any belief ‘not fully, frequently, and fearlessly discussed’ will decay from a ‘living truth’ into a ‘dead dogma’. It was also the position of the preeminent scholar of the Nazi Holocaust, Raul Hilberg, who said of Holocaust deniers, ‘If these people want to speak, let them . . . It only leads those of us who do research to re-examine what we might have considered as obvious. And that’s useful for us’. Pollock’s contrasting opinion—that the Holocaust is a ‘basic truth’ that should be considered ‘sacrosanct’—is more befitting a Church than an ‘Educational Trust’. I think history is for us all to discuss, wouldn’t you? . . . History is for all of us to discuss . . . [A]ll history is our common heritage to discuss and analyse. The founding of the state of Israel, for example, based on ethnic cleansing is there for us all to discuss. The role of Israel is there for us to discuss. So don’t try to subvert that by false stories of antisemitism. I was asked about a speech I had not heard and of which I knew nothing. My reply has been twisted to suggest that I think it is acceptable to question the reality of the Holocaust. I do not. The Holocaust is as real a historical event as the World War itself and not to be challenged. In Primo Levi’s words: ‘Those who deny Auschwitz would be ready to remake it’. The first terrible pictures I saw as a nine-year old are ingrained on my memory as they are for all my generation. Like readers of this paper [i.e., the Guardian], I know the history of Holocaust denial, its place in far right politics and the role of people like David Irving. To imply that I would have anything in common with them is contemptible. The consequences of such a smear are obvious to all: let the poison escape and it will be picked up on social media and reputations may be tarnished for ever. A brief phone call would have clarified my position. The Guardian, which offered Jonathan Freedland a full column with which to accuse Loach of ‘lending a spurious legitimacy to’ and ‘echoing . . . the language’ of ‘Holocaust denial’, published only a single edited paragraph from Loach’s response. Those condemning Loach would doubtless prefer him to have responded along the lines of Deputy Leader Tom Watson MP (‘if there was Holocaust denial there, these people have no right to be in the Labour party, and if they are they should be expelled . . . It is disgusting to deny the Holocaust. These people are cranks’) and Shadow Minister Jonathan Ashworth MP (‘I think party members who make anti-Semitic remarks, who make some of these disgusting Holocaust denial statements, they shouldn’t be in the party, they should be expelled’). But in their rush to denounce before checking the facts, Watson and Ashworth merely lent credence to false allegations, helping Labour’s opponents to discredit the party and slander peace activists. On the evidence presented, the Nazi Holocaust was neither denied nor ‘called into question’ at the Labour Party conference. If Pollock et al. disagree with Peled’s position on free speech and would prefer to see Holocaust denial criminalised, they ought to take it up with the law, while if they are upset that accusations of Holocaust denial are not always taken sufficiently seriously, they ought to stop levelling false accusations of Holocaust denial. Outside the conference building, a group called Labour Party Marxists was handing out a leaflet titled ‘anti-Zionism does not equal anti-Semitism’ that quoted Reinhard Heydrich, one of the architects of the final solution, claiming that Nazism did not mean any harm to the Jews. And what used to be far left is now, through the Corbynite revolution, setting the tone and the mood of the Labour Party. Marxists quoting Nazis to slander Zionists—that pretty much sums up the left nowadays. This fabrication is particularly scandalous, not least because its victim has now been unjustly expelled from the Labour Party. The article in question was written by Moshé Machover, a veteran Israeli Jewish socialist, retired Professor of Philosophy at the University of London and founder of the Israeli Socialist Organisation, Matzpen. It quotes Heydrich speaking favourably of Zionism, not as proof that ‘Nazism did not mean any harm to the Jews’, but rather as evidence that, in the years before Germany attacked the Soviet Union, the Nazi regime and the Zionist movement possessed an element of ideological and practical common ground. Anyway, the Zionists made overtures to the Nazi regime, so how did the Nazis respond? Heydrich (Adolf Hitler’s second in command) wrote the following in September 1935: . . . ‘National Socialism has no intention of attacking the Jewish people in any way’ . . . In other words, a friendly mention of Zionism, indicating an area of basic agreement it shared with Nazism. If the Jews had a state of their own, in which the bulk of their people were at home, the Jewish question could already be considered solved today … The ardent Zionists of all people have objected least of all to the basic ideas of the Nuremberg laws, because they know that these laws are the only correct solution for the Jewish people too . . .
Machover’s article argued that Nazi-Zionist collaboration in this period ‘sounds more shocking than it is’ because ‘in the early days of the Nazi regime’ the Nazis’ anti-Jewish policies were ‘similar to those of other anti-Semitic regimes’, with which the Zionist movement had also been prepared to cooperate for instrumental purposes. The claim that there was a degree of cooperation between Nazi officials and the Zionist movement is in line with mainstream scholarship; to present it as somehow pro-Nazi is a disgrace. Antisemitic trope—Jews and the media. Prominent Jewish activist Naomi Wimborne-Idrissi, founding member of FSOI and Jewish Voice for Labour, spoke before the conference to express qualified support for the rule change on discrimination agreed between the NEC and JLM. But, she added, ‘the person who moved it from the Jewish Labour Movement [i.e., Mike Katz] would have a bit more credibility if his organisation did not spend so much of its time running to the Daily Mail and the Daily Telegraph with stories…’ (2hr10m). She was interrupted at this point by loud cheers from most (not ‘some’) of the room. Wimborne-Idrissi’s remark was condemned as ‘an anti-Semitic trope’ (Jeremy Newmark, JLM), a ‘trope’ that is ‘ludicrously anti-Semitic’ (Telegraph editorial), ‘[l]iterally an antisemitic trope’ (Richard Angell, Progress), a ‘clear’ trope (Ruth Smeeth MP) and an ‘age old stereotype and trope’ (Michaela Vyse, Jewish Leadership Council). But antisemitic propaganda has traditionally depicted Jews as owning the media, not briefing it, while Wimborne-Idrissi’s accusation, and the rapturous applause it received, most likely reflected the JLM’s record of unfounded accusations of antisemitism against Labour members rather than its being Jewish. Verdict: hocus-tropeless. The thing is, if you support Israel, you support apartheid. So what is the JLM and Labour Friends of Israel doing in our party? Kick them out. Jeremy Newmark, chair of the JLM, condemned the comments as ‘hate speech’, adding for good measure: ‘This is a thinly veiled call to purge Jews from the party’. Rebecca Hilsenrath, chief executive of the Equality and Human Rights Commission, stated, ‘These comments by party members show more needs to be done to root out anti-Semitic views that clearly exist in the party. Any suggestion of kicking people out of any political party on the grounds of race or religion should be condemned’. The Board of Deputies claimed that attendees had ‘called for Jews to be purged from Labour’. Ruth Smeeth MP asserted that, ‘when a delegate stands up and says that the Jewish Labour Movement should be expelled from the Labour Party that, full stop, is calling for Jews to be thrown out of the Labour Party’. The Times published an article headlined, ‘Activists call for Jews to be expelled’. Jonathan Freedland claimed in the Guardian that ‘[t]here were loud calls for the expulsion of Jewish groups’. But nobody called for the Jewish Voice for Labour, for example, to be expelled from the party. The Jewish activist in question, speaking at a meeting organised by a largely Jewish organisation, was not demanding his own expulsion. Those Labour members who cheered him, many of them Jews, did not subsequently throw themselves out. The call was directed against two specific organizations, the JLM and the LFI, not ‘on the grounds of race or religion’ but on account of their support for the State of Israel. Unless the JLM is coterminous with ‘Jews’—and the JVL and FSOI were established precisely to demonstrate that it is not—then Newmark, Hilsenrath, Smeeth, and company have no case. For the record, the Jewish Voice for Labour ‘recognises the right of the JLM to organise in the party’ while conference delegate Leah Levane’s speech to conference, which received a standing ovation, explicitly stated that the JLM has ‘every right to organise inside this Labour Party’ (approx. 1hr8m). …undercounting Jews? According to Richard Angell of Progress, ‘In a debate about tacking [sic] antisemitism in Labour one delegate said “the Palestians [sic] are the many” inferring Jews are “the few”’. The delegate in question said: ‘We have talked about injustice, we’ve talked about anti-racism, we’ve talked about being international, and we’ve talked about “the many, not the few”. Well the Palestinians are “the many” and we have to stand with them’ (approx. 2hr8m). This contribution was presented as supporting earlier comments made by (Jewish) activist Naomi Wimborne-Idrissi, who emphasised the need for Labour ‘to stand with the Palestinian people’. The contribution made no other mention of Jews; Angell’s bizarre inference is all his own. ‘Be careful’. The Jewish Chronicle claimed that ‘a number of Jewish Labour delegates’ said they ‘did not feel safe’ at the conference. To illustrate this hostile ‘atmosphere’, it reported the following threat: ‘One delegate warned those supporting tougher action on antisemitism to “be careful”’. This claim of intimidation was repeated by Hope Not Hate chief executive Nick Lowles and by Stephen Pollard, who presented it as a ‘sinister warning’. The delegate in question was JVL founding member and Jewish Labour activist Naomi Wimborne-Idrissi. Her remarks can be heard in full here (approx. 2h10m). Wimborne-Idrissi began by declaring that she would ‘not [be] opposing’ the NEC rule change and praising ‘the agonising work that NEC members have gone through to try and arrive at a good wording’. She then entered in a criticism of the proposed formulation, before concluding with, ‘So be careful NEC, that’s all I say’. There was no ‘sinister warning’—just a note of caution to the NEC, for whose ‘agonising work’ she had just expressed fulsome appreciation, over the potential implications of their formulation. Jewish conspiracies. Finally, it was alleged that to doubt the truth of the above allegations, and to dare suggest that personal, factional and partisan motives might be driving them, was itself an ‘anti-Jewish trope’. According to Jonathan Freedland of the Guardian, to suppose that ‘Jews invent stories of suffering to drive a secret political agenda’ is to claim ‘a Jewish conspiracy’. Never mind that the allegations levelled by Freedland and others were all demonstrably false. Never mind that these fraudulent claims of antisemitism were targeted, almost without exception, at Jews. Never mind that the volume of such false allegations rises and falls in perfect rhythm with the political imperatives of Corbyn’s (and now the JVL’s) opponents. Never mind that the false claims of antisemitism at Labour’s conference emanated from a right-wing press that was manifestly in propaganda mode, as well as from a group within the Labour Party which had clear factional motives for seeking to discredit the FSOI and JVL (the two Jewish groups against which, to reiterate, the overwhelming majority of the antisemitism allegations were levelled). Never mind all this. According to Freedland, and others, to retain one’s critical faculties when a charge of antisemitism has been levelled is itself an antisemitic act. Such self-righteous bullying can only trivialise the issue of antisemitism while breeding genuine resentment against those who allege it—and, insofar as the latter’s pretensions to representativeness gain traction, against Jews more broadly. Widespread claims to the contrary notwithstanding, no credible evidence has yet emerged of even a single antisemitic incident at the Labour Party conference. Instead, the ‘conference antisemitism’ crisis formed an almost exact replay of the fraudulent ‘Labour antisemitism’ crisis of 2016. In both cases, unprincipled partisans and headline-hungry journalists concocted between them a mélange of unwarranted inferences, half-truths and outright lies, which were used to attack an elected party leadership and smear dedicated activists. In both cases, notoriously untrustworthy sources (e.g., ‘Guido Fawkes’) were ingenuously relied upon by mainstream outlets. In neither case did a single mainstream journalist investigate whether the accusations they were publicising were true. Allegations of antisemitism ought to be levelled with care if they are to be taken seriously. Taking allegations seriously means investigating the facts of the matter and then following due process. The depraved spectacle documented above was not driven by over-zealous concern for Jews’ well-being. On the contrary: false allegations of antisemitism enable the real thing by trivialising legitimate concern if and when circumstances warrant it. It’s a classic instance of crying wolf one time—or, in the case at hand, a thousand times—too many. If some activists now greet each and every accusation of antisemitism with suspicion, even a yawn, this is the regrettable but inevitable result of the widespread abuse of the ‘antisemitism card’ as a rhetorical bludgeon. The contempt for truth displayed by those who orchestrated this latest iteration of the ‘Labour antisemitism’ smear campaign was matched only by their actual indifference to Jewish suffering, the moral currency of which they so recklessly and cynically debased. Jamie Stern-Weiner is a graduate student in Middle Eastern Studies. He co-founded New Left Project and is the editor of MOMENT OF TRUTH: Tackling Israel-Palestine’s Toughest Questions, forthcoming from OR Books. Christopher Hope, ‘Jeremy Corbyn Ignores Anti-Semitic Row – and Praises Palestine – in Labour Conference Speech’, Telegraph (27 September 2017). Across the pond, the New York Times reprised its role as amplifier of the attacks. In 2016, perhaps under the influence of columnist Roger Cohen, the Times ran no fewer than four op-eds publicising allegations of Labour antisemitism. This time around, the paper of (broken) record gave space to the novelist Howard Jacobson, who, recalling how ‘the Crusaders . . . swept through Europe annihilating every Jewish community in their path’, warned: ‘When an avenging army takes to the road there will be no check on the exhilaration of its righteousness and slaughter. Labour Party delegates are hardly crusaders, but the whiff of blood lust rises even from Brighton’. ‘New Jew snub row’, The Sun (28 September 2017), p. 8. This prompts the question: If antisemitism at the Labour conference was as pervasive as certain accounts suggest, then why do the authors of those accounts continually cite the same few incidents? On the conference floor, one delegate also characterized Israel as ‘an apartheid state’. [C]an you explain to me why two million people in Gaza have to live without clean water? . . . Can you explain why that’s OK? Can you explain why a child in Gaza with a curable cancer will die, while a Jewish child five minutes from Gaza who was born as an Israeli will live? Can you justify, can you explain that? Can you explain dropping millions of tonnes of bombs on Gaza? Can you explain thousands of political prisoners? And on and on and on. And I think what this does, it diminishes the antisemitism claim and it puts the burden on them to explain this. . . But silence over claims of ‘antisemitism’ will read as guilt, while rebutting allegations is (as the length of this article testifies) a laborious process that inevitably distracts from and obscures Israel’s crimes against the Palestinians. Activists tempted to indulge in gratuitously incendiary rhetoric, such as analogising ‘Zionists’ to Nazis, ought to reflect on whether this contributes to the struggle for justice in Palestine, or whether, on the contrary, it makes life easier for Israel’s apologists. Even the IHRA definition of antisemitism states merely that Israel-Nazi analogies ‘could, taking into account the overall context’, be antisemitic, and it has not been established or even argued that ‘the overall context’ was qualifying in this case. See further on this subject David Feldman, Sub-Report for the Parliamentary Committee Against Antisemitism (January 2015), pp. 6-8. Jonathan Goldstein, ‘Come On Corbyn: Make This Labour’s Day of Atonement’, Sunday Times (1 October 2017), p. 24. ‘However unwillingly a person who has a strong opinion may admit the possibility that his opinion may be false, he ought to be moved by the consideration that however true it may be, if it is not fully, frequently, and fearlessly discussed, it will be held as a dead dogma, not a living truth’. John Stuart Mill, On Liberty, fourth edition (1869 ), II.21. Raul Hilberg, cited in Norman G. Finkelstein, The Holocaust Industry: Reflections on the Exploitation of Jewish Suffering, second edition (London: Verso, 2003 ), p. 71. A Times editorial simultaneously condemned and endorsed Peled’s remarks: ‘[T]his ugly, unacceptable phenomenon of left-wing antisemitism has been amply on display on the Labour conference fringe. A meeting purportedly devoted to free speech heard calls . . . for “the freedom to criticise and to discuss every issue”, including whether the Holocaust had ever happened. A free society must allow the expression even of bigotry like this’. Emphasis mine. In the Jewish Chronicle, Dave Rich of the Community Security Trust placed Loach at ‘the softer end of Holocaust Denial’ and accused him of ‘doing neo-Nazis’ work for them’. The Jewish Chronicle has not informed its readers of Loach’s response to the charges. The expulsion letter reproduced the offending article, which it characterised as ‘apparently antisemitic’ per the IHRA definition of antisemitism. However, its author—Moshé Machover—was technically suspended on the grounds not of antisemitism but of supporting the Communist Party of Great Britain and the Labour Party Marxists. The pretext is absurd: Machover is not and has never been a member of either group, but merely contributed to their events and publications. Machover’s own response to a genuine case of antisemitism underscores, by way of contrast, the cynicism of his persecutors—see ‘Statement on the Banning of a Concert by Gilad Atzmon’, jews4big.wordpress.com (10 March 2015). Cf. Moshé Machover, ‘In defence of history: Reinhard Heydrich, Zionism and saying the “unsayable”’, LabourPartyMarxists.org (2 October 2017). In smearing Professor Machover, the antisemitism-mongers have doubtless overreached. Machover is well-known in the UK and internationally, and the notion that he is antisemitic or pro-Nazi is preposterous. On an intellectual level, should Machover choose to confront such notable nullities as Dave Rich, he will wipe the floor with them. Was it, then, a different Jeremy Newmark, of a different JLM, of whom the Daily Mail reported: ‘Jeremy Newmark, the chairman of the Jewish Labour Movement (JLM) . . . toured the studios to criticise the fact the [FSOI] meeting had been advertised in the conference guide . . . Newmark told Sky News: “They allowed their meeting to become an arena for what effectively amounts to a call for Jews and Jewish groups to be purged from the party. I think Mr Corbyn must be acutely embarrassed…”’? Or, did Wimborne-Idrissi’s antisemitism consist in her referencing the Telegraph instead of Sky News? Ruth Smeeth MP, quoted in Arj Singh, ‘Jewish Labour Movement Calls For Action Over “Anti-Semitic Trope”’, Press Association (26 September 2017). 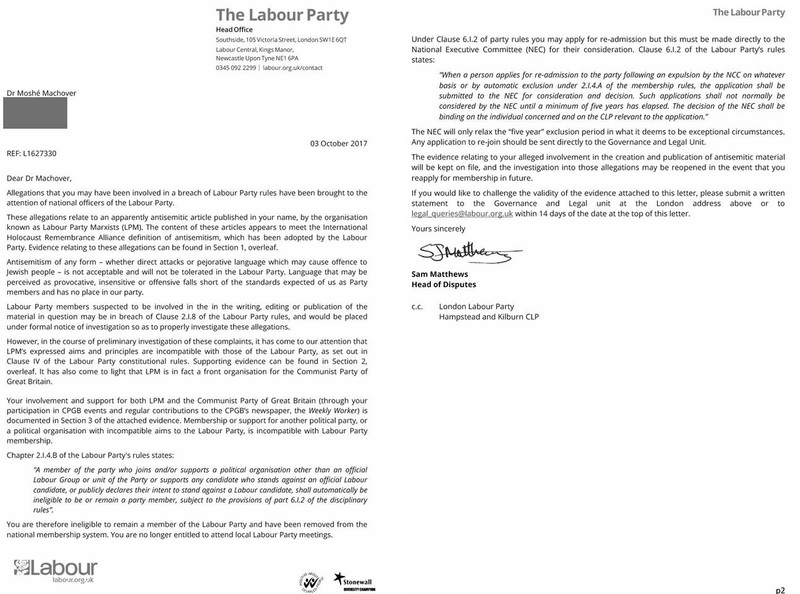 The LFI is not in fact in the Labour Party. Subsequently, a conference delegate stated that, ‘We can’t be a party that has groups that support an apartheid state, wherever that apartheid state is’. This was apparently a reference to the JLM and LFI. The delegate in question nowhere advocated that ‘Jews’ be expelled; on the contrary, she presented her contribution as supporting one made the previous day by a Jewish Labour activist. Ruth Smeeth MP, quoted in Arj Singh, ‘Jewish Labour Movement’. If Smeeth was here referring to Michael Kalmanovitz, her description of him as a ‘delegate’ was incorrect. He was not a delegate, and was addressing a relatively small fringe meeting rather than the main conference floor. Lucy Fisher and Oliver Wright, ‘Activists Call for Jews to be Expelled’, The Times (26 September 2017). They also posted a Facebook post with similar wording. Specifically, Wimborne-Idrissi worried (in my view unnecessarily) that the proposal to sanction the ‘holding’, rather than merely the ‘expression’, of prejudiced beliefs introduced into the rule-book the principle of ‘thought crime’. When Mike Katz of the JLM alleged ‘partisan’ motives behind Jewish criticism of his group’s collaboration with the Labour Party, was he also propagating a ‘Jewish conspiracy’? Heydrich may well have been lying in his honeyed words about Zionism. But the really shocking thing is that he was responding to the Zionists’ positive, nay enthusiastic, comment on the Nuremberg Laws. Were they also lying when they did so? Here’s the link. Get hip to the net, comrade! ← DID ISRAEL THWART ANOTHER PALESTINIAN “PEACE OFFENSIVE”?